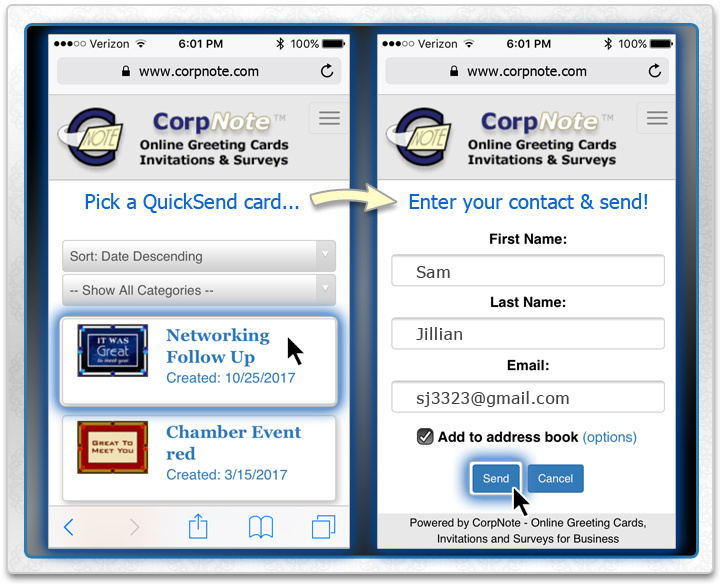 CorpNote's QuickSend is perfect for when you want to send an eCard, invitation or survey in less than 30 seconds. Perfect for Tradeshows, Sales Meetings, Customer Service follow ups and more! You don't need to download an app — QuickSend works with cell phones, mobile devices and desktop computers by simply going to corpnote.com in any web browser. 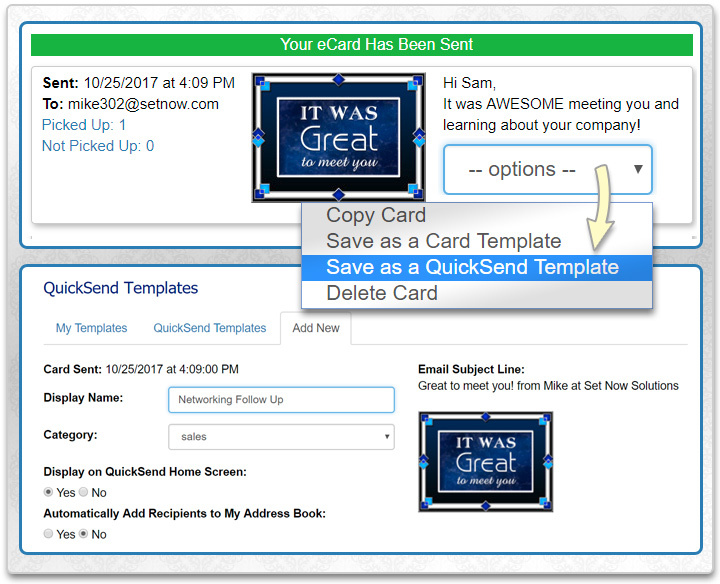 Design and send yourself an eCard – then save it as a QuickSend Speed Template. When you're on the go, simply pick a template, enter a name and email address, and click "Send". 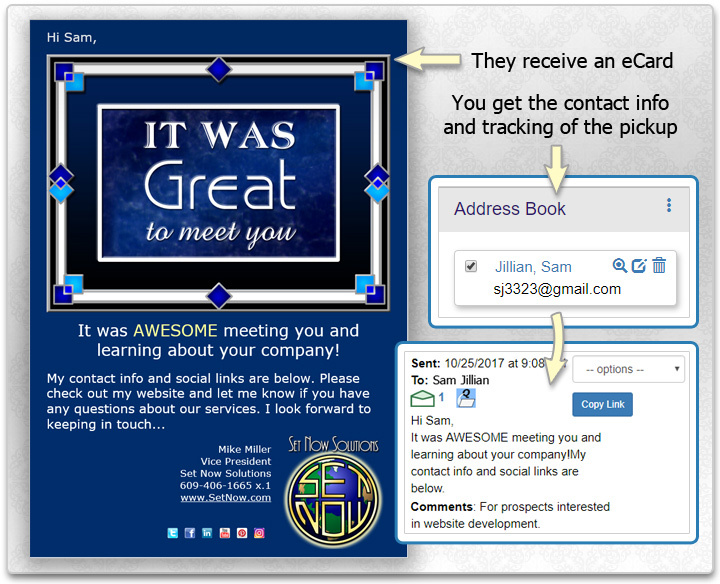 Your contact gets a customized eCard and their contact information gets saved in your address book. You can track your eCard views in real-time. If the eCard included an invitation or survey, you will also see if the person responded. Quickly send a potential customer an introductory message that contains information about your company and includes contact information. Easily send event information in less than 30 seconds which includes a link for online registration. Instantly send an email that contains information about a product or service you are promoting while building your business contact database. Immediately send a thank you letter and customer satisfaction survey after completing a sale or service. For more information, view our QuickSend eCards, Invitations and Surveys tutorial. "What a great way to communicate with our members! Whether it's dropping them a line welcoming them as a new member, thanking them for a sponsorship, or inviting them to an event, it's a great resource and a quick way to keep in touch! It's truly a great eCard and invitation service!"